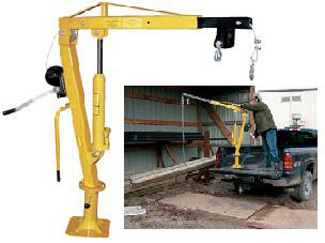 Installed in your pick-up truck bed, this Winch Operated Truck Jib Crane will help lift loads up to 1,000 pounds. Lift items from ground to truck bed height, then rotate into cargo area. Includes telescopic boom design with manual hydraulic hand pump to pivot boom up and down. Manual cable winch (with ¼" cable diameter) to lift and lower loads. Unit comes with one grab hook, one chain slot lock, and one sling hook with latch. Mounting plate is 10½" by 10½". Base height is 12½". Overall height is 56". The crane swivels on a 360° base. Safety yellow in color. Welded steel construction. Specs. Boom Reach 49 1/4", Lift Range 0 To 105", Max Lift 90". I just got finished installing my new aluminum truck crane. ..